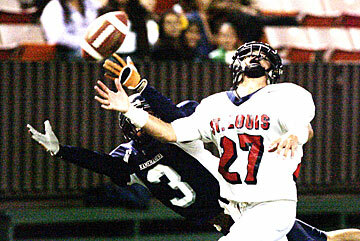 Saint Louis' Jeffrey Kahler defended on an incomplete pass in the end zone intended for Kamehameha's Justin Saniatan at the end of the second quarter. DREAMS of a repeat state championship for Kamehameha have come to an end. Cameron Higgins rushed for two touchdowns and Stephen Lei's interception with under a minute left sealed the victory as the second-ranked Crusaders kept their season alive with a 14-7 victory over No. 4 Kamehameha last night at Aloha Stadium. Saint Louis will face No. 3 Punahou at 7 p.m. Monday at Aloha Stadium for the Interscholastic League of Honolulu championship and a spot in the HHSAA Division I state tournament after defeating Kamehameha for the third consecutive time this season. "We came out working hard, took it play by play, and we're feeling very confident right now," Lei said. After the Warriors came up empty on a drive that started on the Saint Louis 26-yard line after a bad punt, the Crusaders got a huge 38-yard run from Cody Wells. That helped set up a 26-yard touchdown run by Higgins to gave the Crusaders a 7-0 lead midway into the second quarter. The score came on a busted play that saw Higgins scramble to his left and find nobody in front of him as he marched into the end zone. "It was huge to get on the board first," Crusaders coach Delbert Tengan said. "That's the key to this format." The game was played in eight-minute quarters instead of the usual 12 in order to allow for one team to play three games in nine days and still be ready for the state tournament. Higgins gave Saint Louis a 14-0 lead as he scored from 10 yards out on the Crusaders first drive of the second half. 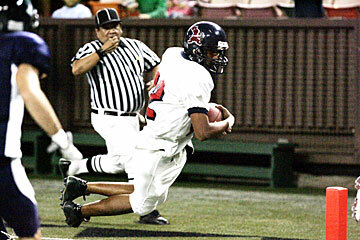 Seemingly down and out, the Warriors would come up with an answer as sophomore Michael Hoke, who got the start over regular starter George Kaai, capped off a 10-play, 60-yard drive by finding Justin Saniatan on a fourth-and-12 play in the end zone for an 18-yard touchdown pass to make the score 14-7 just before the end of the third quarter. Saint Louis' Cameron Higgins jumped across the goal line to score the Crusaders' first touchdown in the second quarter of last night's game. "It was a coaches' decision," Kamehameha coach Doss Tannehill said of the quarterback switch. "We need to run the ball to be successful and (Saint Louis) does a good job of shutting us down." The Warriors got a break with six minutes to go as Rykin Enos recovered a fumbled lateral from Higgins. A 12-yard scramble from Hoke on fourth-and-eight was negated by a holding penalty, forcing the Warriors to punt. Kamehameha would make the Crusaders punt the ball right back to get one last chance, and Hoke completed three passes for 37 yards on the drive before Lei's interception ended the Warriors comeback. "I just can't say enough about the defense," Tengan said. "They did a nice job of shutting down the run and we really were able to pressure the quarterback." Hoke finished 9-for-21 for 87 yards and the one interception while leading receiver Aaron Nichols was held to 41 yards receiving on five catches. The Crusaders rushed for 167 yards and held the Warriors to just 136 total yards as they now prepare to face Punahou in five days with everything on the line. "This is it," Higgins said. "We got the win tonight and we're going to be ready for Punahou. They're not going to beat us three times." StL--Cameron Higgins 26 run (Matthew Terry kick). StL--Higgins 10 run (Terry kick). Kam--Justin Saniatan 18 pass from Michael Hoke (Kamakana Osorio kick). RUSHING--Saint Louis: Higgins 11-78, Cody Wells 9-55, Shane Ahlo Jr. 2-18, Chase Alcott 1-16, Preston Lynch 2-7, team 3-(-7). Kamehameha: Jeremiah Dela Pena 4-24, Bryson Vivas 8-24, Jordan Rego 1-3, Parker Paredes 1-1, Hoke 6-(-3). PASSING--Saint Louis: Higgins 3-7-0-12. Kamehameha: Hoke 9-21-1-87. RECEIVING--Saint Louis: Kulia Aiona 1-8, Ahlo Jr. 1-6, Wells 1-(-2). Kamehameha: Aaron Nichols 5-41, Saniatan 2-15, Kaleo Perez 1-19, Noah Wong 1-12.